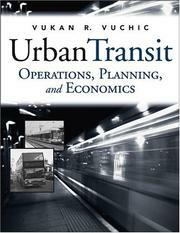 The only modern text to cover all aspects of urban transit operations, planning, and economics Global in scope, up-to-date with current practice, and written by an internationally renowned expert, Urban Transit: Operations, Planning, and Economics is a unique volume covering the full range of issues involved in the operation, planning, and financing of transit systems. Presenting both theoretical concepts and practical, real- world methodologies for operations, planning and analyses of transit systems, this book is a comprehensive single-volume text and reference for students as well as professionals. The thorough examination of technical fundamentals and management principles in this book enables readers to address projects across the globe despite nuances in regulations and laws. Dozens of worked problems and end-of-chapter exerciseshelp familiarize the reader with the formulae and analytical techniques presented in the book’s three convenient sections: Transit System Operations and Networks Transit Agency Operations, Economics, and Organization Transit System Planning Visually enhanced with nearly 250 illustrations, Urban Transit: Operations, Planning, and Economics is a reliable source of the latest information for transit planners and operators in transit agencies, metropolitan planning organizations, city governments, consulting firms as well as students of transportation engineering and city planning at universities and in professional courses.